If you are serious about watching what you and your family eat, you would probably look for healthy, certified good food products whenever you go grocery shopping. Then I would like to suggest you checking out The Real Deal Snacks, a line of all natural, delicious, wholesome snacks made with the finest grains and vegetables grown on the Corriere Family Farm in the Lehigh Valley of Pennsylvania! The Real Deal Snacks come in various forms and flavors, including Snack Mix, Cheese Crunchies, Corn Tortilla Chips, Veggie Chips and Corn Pretzels. The Veggie Chips, Corn Tortilla Chips and Corn Pretzels in particular, have received the Non-GMO Project Verified seal, which assures that the products have been produced according to best practices for GMO avoidance. I recently received a variety pack of The Real Deal Snacks for review. My favorite is the yummy and crunchy Original Veggie Chips. Made with real green peas, real corn and real rice, The Real Deal Veggie Chips provide a serving and a half of vegetables in every once! Besides the Original flavor, the Veggie Chips are also available in Sriracha and Aged White Cheddar. 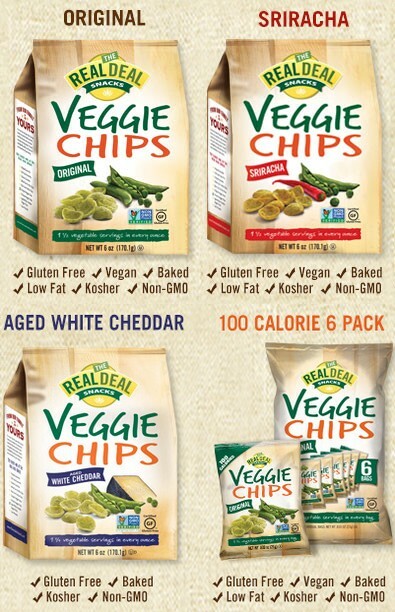 All of them are gluten-free, certified kosher, baked and contain 80% less fat than potato chips. The 100 Calorie 6-pack is prefect for healthy snacking on the go, with 1 1/4 servings of vegetables in each individual bag. 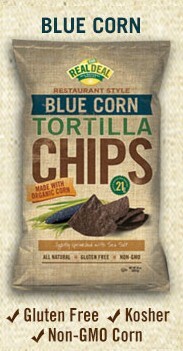 I also tried the Real Deal Restaurant Style Blue Corn Tortilla Chips, which are made with organic corn and lightly sprinkled with sea salt. These unique-colored, great-tasting chips provide 21g of whole grain per serving. Coming in a huge bag, they are awesome as a party snack when served alone, or paired with dip or salsa. The Real Deal Snacks are available for online purchase at Amazon.com. If you live in the San Diego area, you can also find them at Whole Foods, Albertsons, Baron's and Keils Grocery. Please follow The Real Deal Snacks on Facebook and Twitter for company news and creative ways to enjoy their amazing products! This giveaway is part of the Shower Me with Giveaways Giveaway Hop hosted by Karen’s Got Mail. So after entering my giveaway, please be sure to hop around to the other participating blogs on the linky for more chances to win. Good luck! Disclosure: I received free products to facilitate my honest review. All views and opinions are my own. icefairy's Treasure Chest is not responsible for prize fulfillment.